Cast: Paul Barber, James McMartin, Tom Bell, Samantha Janus, Gary Mavers. Directed by James Marquand, written by Marquand and star James McMartin. Gritty British movies are great - but although Dead Man's Cards has the ingredients to be another choice underrated morsel, it never manages to quite bake the cake. Is that really Denzil from Only Fools and Horses? Yes, it is, and who would've thought he could act this well? 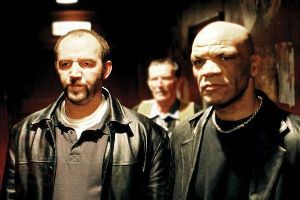 Paul Barber, as he's known in the real world, is sensationally good as the experienced and world-wise bouncer, upstaging the "main" character James McMartin, who also co-wrote the script. Barber's world is a very real one, no doubt helped by McMartin's real-life history as a doorman, and this seedier side of Liverpool's nightlife is the focus of the movie. With Barber and McMartin taking on the local criminals in a manner reminiscent of any number of Clint Eastwood movies, the violence soon appears, but doesn't seem gratuitous or out of place. For once, it's all part of the atmosphere and would have been missed if it wasn't there. The boom mike peeking in at the top, however, wouldn't have been missed. It happened in The History Boys and it happened here too - are we Brits really that unobservant? 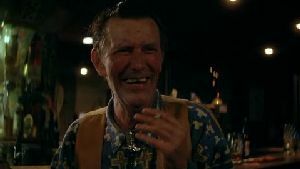 Supporting the electric Paul Barber is the late Tom Bell, in his last movie before his unfortunate death at the age of 73. He's one of those actors you recognise from loads of TV programmes, but can't quite think of an example (he was in Prime Suspect, for one). He's one of the highlights here, as the wibbling and cowardly club owner, and in fact most of the supporting cast are very good - but I must single out one exception. The character Chongi - the crime boss - was so unutterably awful that I thought he must be a footballer doing a cameo. But no - Mark Russell (a name you won't be needing to remember) is actually a fully paid up actor, but he's so bad that I could have done better myself. I can only assume he was blackmailing the director James Marquand, who also comes in for criticism. Despite having many positive things to say about the pieces of this jigsaw, the director completely fails to bring them together as a whole. Samantha Janus's scenes seem incongruous, as if there was much more of her that got cut out, and the presentation goes a bit Revolver at the very end, with a real what-was-that-all-about feeling to the final couple of minutes. It's a shame, because with more experienced direction, this could have been a cult classic. Dead Man's Cards has a lot going for it, but the muddled direction ruins everything. It's still worth watching, if only for Paul Barber's stand-out turn, but I can't help feeling disappointed as it should have been much better. Testosterone Satisfaction Rating: 3/5 - brutal violence and hard drug use. To enjoy this film you should: expect little. Dead Man's Cards was released in the UK on 15th December.